Casgliad o englynion a gyfansoddwyd yn y 9fed a\'r 10fed ganrif, yn cofnodi beddau arwyr traddodiadol a chwedlonol Cymru: Pryderi, Lleu Llaw Gyffes a Dylan ail Ton o\'r Mabinogi; Cai, Rhydderch Hael ac Elidyr Mwynfawr o\'r Hen Ogledd; Gwalchmai, Bedwyr, Owain ab Urien a Chynon ap Clydno y chwedlau Arthuraidd. A collection of verses, composed perhaps in the 9th or 10th century, enumerating the graves of traditional, mythological and legendary heroes of early Wales: Pryderi, Lleu Llaw Gyffes and Dylan Eil Ton from The Mabinogi; Cai, Rhydderch Hael and Elidyr Mwynfawr from the distant \'Old North\'; Gwalchmai, Bedwyr, Owain ab Urien and Cynon ap Clydno from Arthurian legend. John K. Bollard is an American scholar and editor who holds an MA in Medieval Welsh Language, Literature, and History from the University College of Wales, Aberystwyth (now Aberystwyth University), and a PhD in English from the University of Leeds, where he wrote a dissertation comparing Welsh and Middle English Arthurian narratives. He is perhaps best known in Wales for his studies of the structure and literary qualities of the Four Branches of The Mabinogi and articles on other early Welsh tales and poetry. He recently co-edited, with Michael Livingston, Owain Glyndŵr: A Casebook (2013). Anthony Griffiths is a landscape photographer and acoustic guitarist born in Bangor, who lives in Aberystwyth. Whilst a student at Coleg Harlech in 1973, he became interested in rock climbing and hillwalking, which led to an interest in landscape photography and the archaeology of prehistoric Wales. In 1989 he was joint winner in photography at the National Eisteddfod in Llanrwst. In 1993 he published Snowdonia Myth and Image, and in 2010 Gwasg Carreg Gwalch published his photographic tour of Wales’ last wilderness: Elenydd: Hen Berfeddwlad Gymreig / Ancient Heartland of the Cambrian Mountains. Griffiths and Bollard first met in the 1960s and frequently played music together during the heyday of the Aber Folk Club. Thirty years later they again met by chance and soon began collaborating on the Legend and Landscape of Wales series: The Mabinogi (2006), Companion Tales to The Mabinogi (2007) and Tales of Arthur (2010). Tales of Arthur won the Welsh Books Council award for Photography/Art Book of the Year. 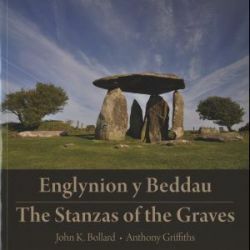 Englynion y Beddau / The Stanzas of the Graves is their fourth book together. Englynion y Beddau / The Stanzas of the Graves is a collection of verses, composed perhaps in the 9th or 10th century, enumerating the graves of traditional, mythological, and legendary heroes of early Wales: Pryderi, Lleu Llaw Gyffes, and Dylan ail Ton from The Mabinogi; Caw of Prydyn, Rhydderch Hael, and Elidyr Mwynfawr from the distant ‘Old North’; Gwalchmai, Bedwyr, Owain ab Urien, and Cynon ap Clydno from Arthurian legend, and many others. Here is even the grave of Arthur himself – or is it?